Westbury A350 Bypass: NEW Government Consultation on a "Major Roads Network"
Topic: Westbury A350 Bypass: NEW Government Consultation on a "Major Roads Network"
The Government has just started a major new consultation about the above, which will create a new funding stream for major local authority roads such as the A350 between Warminster and the M4. It could be the way that a Westbury Bypass would be funded …. Especially as the possible lot size of £50-100m is out of reach for the Swindon and Wiltshire Local Economic Partnership (which controls the current pitiful pot of money). If you click on the Wiltshire part of the map, red lines will appear which represent the possible roads for the major roads network of major local authority roads. This includes the A350 between Warminster and the M4. Re: Westbury A350 Bypass: NEW Government Consultation on a "Major Roads Network"
NEWS of possible funding for a Westbury bypass has received the support of local MP Andrew Murrison, who has suggested that a western bypass could be the answer to Westbury’s traffic congestion. Last month, a bypass for Westbury returned to the spotlight after it was revealed that the A350 could be in line for extra funding as part of Government plans for a ‘major road network’. The proposal by the Department of Transport, earmarks the A350 between the M4 at Chippenham and the A36 in Warminster to be part of a new major road network across England, as part of the government’s transport investment strategy. In 2009, plans for an eastern bypass around Westbury were turned down by the Secretary of State for Transport because of its potential environmental impact, but MP for the area, Andrew Murrison, has suggested that a western bypass could be the way forward. In response to the news, the MP has also spoken with Transport Secretary Chris Grayling and Roads Minister Jesse Norman to point out the opportunities for Westbury and district and the possible risks if the proposed north-south route strategic does not involve taking the highway out of the centre of the town. He said, “The route from Poole, which is one of our biggest and fastest growing seaports, and the M4 is appalling all the way through Dorset and Wiltshire. In places it resembles a cart track. To cope with the increasing traffic predicted, a major overhaul is needed. “With the prospect of new money from the Treasury, that brings opportunity for the relief at last of Westbury and Yarnbrook. However, I do not want to see us lose out, only to get yet more heavy traffic dumped on the doorstep of my long-suffering constituents, or to waste time looking at routes that were comprehensively dismissed a decade ago. “We can’t countenance any increase in transit traffic along the A350, particularly heavy traffic, without dealing with the appalling congestion, noise, vibration and air pollution that affects my constituents in the middle of the town. While reading up on this issue and other local road schemes, I wondered about how the current works upgrading the Chippenham Bypass were funded. This led me the following extract from a document found on the Swindon Authority website, and published as a result of a Parliamentary Question related to works in the Chippenham area. - Partly funded under the Department’s ‘Access for All’ scheme, £2.2m to install a bridge and lifts at Chippenham Station. The station officially opened by Network Rail on 22nd January 2016. - The A350 north of Chippenham from Badger Roundabout to Chequers Junction, A350 Chippenham Bypass is being upgraded to a dual carriageway. The improvements will help reduce journey times and ease the congestion around this area. Estimated to be completed and opened by August 2018. - A429 Malmesbury Access scheme - £1.4m for transport improvements to improve traffic flow and facilitate the expansion of Dyson at their Malmesbury site. - Chippenham station hub - £16m for the redevelopment of Chippenham station including enhanced parking and retail offer and new railway crossing. - A350 Dualling Chippenham Bypass - £8.8m for dualling the A350 north of Chippenham from Badger Roundabout to Chequers Junction. • Wiltshire Council benefited from Local Pinch Point funding of £1.905m towards the A350 Chippenham Dualling. This scheme completed in March 2015." All well and good, but the sums involved make the shortfall of £700K for the missing Westbury bridge seem trivial. 1. Why should Wiltshire be paying for improvements to facilitate a private company? Shouldn't Dyson contribute to that? 2. Similarly, shouldn't Network Rail cover the costs for upgrading Chippenham station? 3. Why can't Local Pinch Point funding be made available for the Westbury bridge? 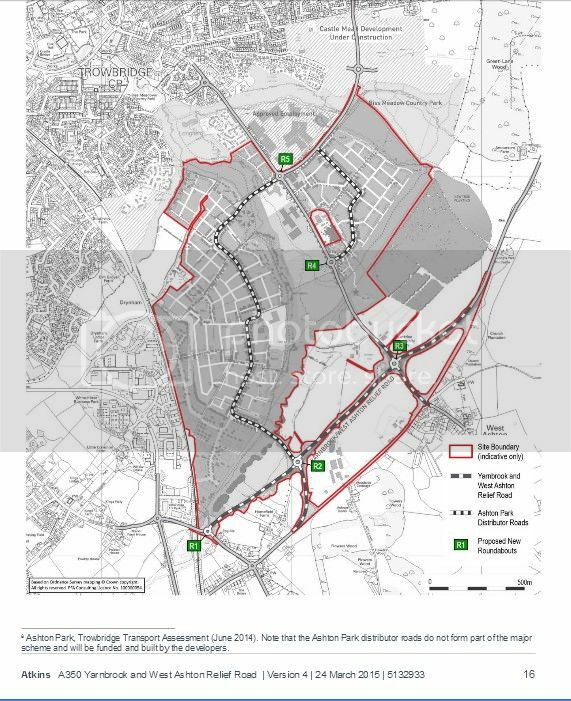 Something else I stumbled on and wasn't aware of the scale of is the Ashton Park development which seems to be driving the Yarnbrook scheme, due to start in April 2018. I wonder how this will link into any Westbury Bypass planning? Something else I stumbled on and wasn't aware of the scale of is the Ashton Park development which seems to be driving the Yarnbrook scheme, due to start in April 2018. I wonder how this will link into any Westbury Bypass planning? It answers one of the reasons given for the refusal of planning permission by the Labour Secretary of State for Transport for the eastern Westbury (A350) bypass in 2009. It was said that the Yarnbrook Roundabout and West Ashton crossroads were existing pinch points delaying A350 traffic which ought to be tackled before a Westbury bypass could be justified given the negative effects the proposed Westbury bypass would have on the local landscape. In short, Wiltshire Council is gradually doing everything else that is needed on the A350 to upgrade it through Wiltshire and .... actually quite soon (within 10 years or so) ... the Westbury bypass will be more desperately needed and will be completely justified and the money will be found. The only real issue will be the route. I will support any buildable route that is actually a bypass (rather than a diversion within the town just moving traffic from part of the the town to another) which radically reduces traffic on the current A350 route through Westbury. Russell, if I may pick up on the latter part of your post above, regarding a diversion versus a bypass, and applying it to the Yarnbrook/West Ashton Relief Road scheme, it is difficult to see how there is much relief at the Yarnbrook end. The scheme seems to split the traffic flow at the new roundabout R2, which may afford some relief at the old Longs Arms roundabout, but that may be offset by additional traffic generated by the industrial provision on the Ashton Park development. The main problem of getting the bulk of the traffic across or under the railway is not addressed, and will have to be when considering the Westbury Bypass ( or the West Wilts Bypass as I recall it from the 1970/80s, I still have the consulation pamphlet around somewhere). We have known of this plan for some two years now and in reality it does nothing to alleviate the traffic problems of Yarnbrook unless it is accompanied by a re-routing of the A350. I too would support any buildable route from the A36 that bypasses Westbury, Hawkeridge, Southwick, and North Bradley, a big ask I know but achievable with this sort of money. An ideal route would be one that leaves the A36 at Standerwick with links to and from the West Wilts Trading Estate, but Murrison is right when he talks as he does of the A350s route through Dorset and Wiltshire. It is to be hoped that his views have some sway in Westminster. I've asked senior highway officers many times since 2009 about the way forward for the Westbury A350 bypass. First they talked about the West Ashton crossroads and Yarnbrook diversion which I think will make sense when it is realised that quite a lot of lorries come along Southwick and North Bradley and use the Yarnbrook roundabout to go north up the A350 and vice versa. If that traffic goes along the new North Bradley - West Ashton diversion, the Yarnbrook roundabout is relieved of lorries enough to make it flow much better ... though this alone is not the whole solution. Secondly, they've talked about analysing all the possible routes for a Westbury bypass from scratch because to justify any funding they must show they've properly considered all routes and reasons for ruling any out. Fourthly, I've now been told that the likely lot size is £50-100m which is basically a doubling of the previous cost. This might be because road construction costs have risen sharply or maybe because they expect a much longer western route ... I'm not sure which yet, but I do think that the eastern route is still a clear possibility as it remains the shorter most economical route which actually removes most traffic from the town itself. I think any Westbury bypass (east or west) would have to be accompanied with other improvement works for Southwick and North Bradley but I'm not sure what at this stage as I don't understand what their problem is. Sure, they have traffic but it is nothing compared to the A350 traffic through Westbury and the gardens tend to be long whereas the traffic in Westbury is right in front of front doors for the terraced housing in Warminster Road and West End and Fore Street that is right up to the pavement. Whilst that may be true for the Southwick/North Bradley traffic, there is also a large flow to/from the West Wilts Trading Estate and the Savencia factory, which still largely uses the direct route to the Yarnbrook roundabout, not Phillips Way. This flow will still most likely use the direct route, forming a crossing flow which hinders traffic on the A350. Clearly, this is a complicated subject, but I seriously doubt that a strategic long term view for an integrated transport network is being taken, and we are left with poor short term piecemeal schemes. Even the consultation mentioned in the original post only addresses Warminster to the M4, and reluctant as I am to agree with Dr. Murrison, he does seem to have the right idea on this.